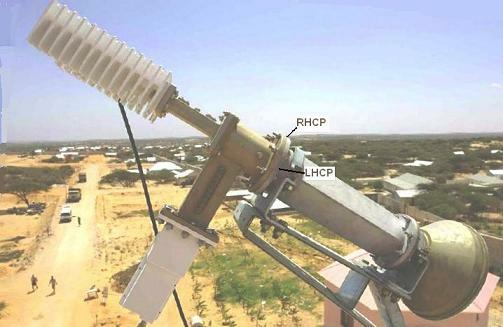 Information here about circular polarisation feed assembly is derived from information kindly provided by Level 421 who provide satellite internet access service in Africa using this C band satellite beam. The image above shows the Intelsat 904 satellite, C band west hemi beam. The satellite is over the Indian Ocean at 60 deg east longitude. If you are in the furthest West Africa coast, Sahara Occidental to Gambia, the elevation angle is 5 deg, low down near the horizon. There are three lines up and down the map. The furthest west is the zero elevation line. The next is the red 5 deg elevation line and this is normal limit for C band operation. The 10 deg elevation line is also shown. The west hemi beam provides excellent coverage of Africa, the Middle East and Europe. The contour levels show that the furthest north east tip of Somalia is not well covered. The hemi beam uses circular polarisation which is ideal for equatorial regions. Linear C band polarisation is unsuitable for use in the tropics. The hemi beam operates A pol or Right hand circular polarisation RHCP on the downlink (4 GHz band). The hemi beam operates A pol or Left hand circular polarisation LHCP on the uplink (6 GHz band). The image below shows a cross pol C band circular polarisation feed configured for RHCP receive and LHCP transmit. The image above shows a cross pol C band circular polarisation feed configured for RHCP receive and LHCP transmit. Cross polarisation relates to the assembly of the LNB and BUC to the OMT. There are two alternative ways of attaching the BUC to the OMT. Note that in this image the LNB and BUC rectangular waveguides are crossed relative to each other. They are both linear polarisations; the BUC is vertical polarisation and the LNB is horizontal polarisation. This means the whole feed will transmit and receive on opposite (i.e. cross) polarisations. Note the labels on the polariser flange and the adjustable joint. It may be attached in alternative ways. The OMT is attached to the polariser so that the label marked RHCP is directly away from, or directly towards, the LNB side arm. Either makes the receive RHCP and the transmit LHCP. The label marked LHCP needs to be directly away from, or directly towards, the LNB side arm. The image below shows the downlink frequency spectrum in this C band hemi beam. The frequencies shown refer to L band frequencies in the cross site cable from the LNB. The C band LNB uses a local oscillator frequency of 5150 MHz so, for example, the red carrier shown at approx 1186 MHz refers to a downlink carrier at 5150 - 1186 = 3964 MHz. The high level signals to the left of the spectrum are probably Wimax local signals around 3500 MHz, which do not appear to be causing any problem even though they are 15 dB (31 times) higher than the satellite signals, but it might not be a good idea to put a satellite dish next to a Wimax base station, where the levels might easily be 40 dB (10,000 times) higher and might overload the LNB, in the absence of good filtering. There is a green 27.5 MHz wide carrier at 3655 MHz used for Zee Network satellite TV programming. Page created 4 Feb 2008, amended 16 May 2016. 6 April 2019 HTML5.